Hugely favorite of mine as a teenager, ca. 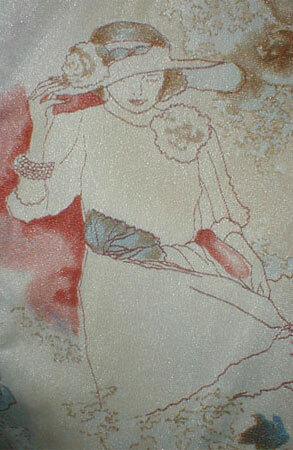 1975, was a knit shirt with an interesting print of a flapper woman in various settings. Recently I came across several items from the same period, all with the same nostalgic bent. 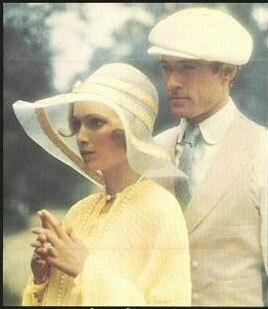 Probably critical in this 1910s to 1920s nostalgia was the film of The Great Gatsby, starring Robert Redford and Mia Farrow, which came out in 1974. 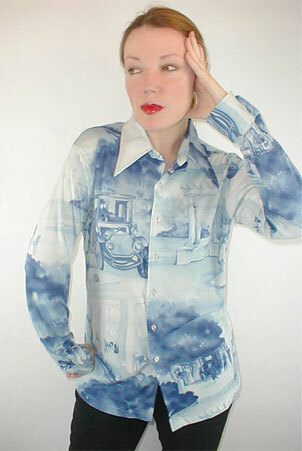 The early to mid 1970s were all about exploring past fashions, sometimes literally (wearing vintage clothing), sometimes fairly literally (wearing new clothing with many features taken from vintage clothing), and sometimes imaginatively (like these disco shirts with vintage images). 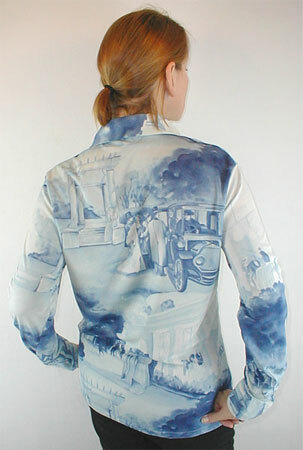 These shirts, two for the girls and one for the guys, are in my eBay store right now.